Nokia N810 Internet Tablet - woohoo! 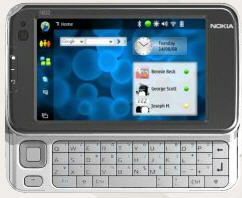 The multi-faceted Nokia N810 internet tablet has finally arrived on store shelves. This highly anticipated Linux-based gadget has more gadgety features than you can shake a stick at - including a slide-out QWERTY keyboard, built-in GPS, digital audio/video playback, Bluetooth, camera, MP3 player and even Wi-Fi capability for surfing and VoIP calling. Like the Nokia N800 Internet Tablet, its predecessor which runs Skype (with the latest firmware), the N810 will come pre-bundled with Skype, making it one of the most powerful portable VoIP devices out there. The Nokia N810 gives you a truly portable Internet experience that's actually useful due to its large 4.13" color wide-screen display and touchpad screen navigation. It sports a 400MHz processor, Mozilla-based Web browser, and up to 10GB of memory (which comes as 2GB of internal memory with an optional 8GB memory card combined). I like how the N810 has the camera in the front, unlike the Nokia N800 where it pops out of the side. It also features an auto-dimming screen so when you use the GPS feature in your car, it dims the screen slightly so you aren't blinded by the screen at night. The N810's browser has a Flash 9 plugin, and supports AJAX, which I don't believe any other mobile device can do, including the iPhone. The N810 also adds support for Windows Media codecs, which gives you access to more video content on the web. 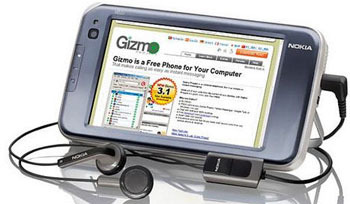 Besides Skype and Mozilla, other applications supported include Rhapsody, Gizmo as well as a few games (Chess, Blocks, Mahjong and Marbles). Gizmo, a Skype competitor apparently even supports video chat on the device. Cool! Retailers where you can buy the Nokia N810 Internet Tablet include Best Buy Mobile, CompUSA, Micro Center, and Nokia stores in New York and Chicago. The N810 is available for a suggested retail price of $479. 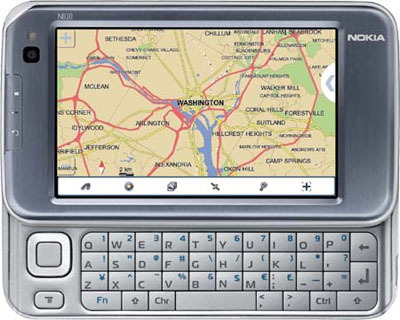 \nThe Nokia N810 gives you a truly portable Internet experience that's actually useful due to its large 4.13" color wide-screen display and touchpad screen navigation. It sports a 400MHz processor, Mozilla-based Web browser, and up to 10GB of memory (which comes as 2GB of internal memory with an optional 8GB memory card combined). \nI like how the N810 has the camera in the front, unlike the Nokia N800 where it pops out of the side. It also features an auto-dimming screen so when you use the GPS feature in your car, it dims the screen slightly so you aren't blinded by the screen at night. \nThe N810's browser has a Flash 9 plugin, and supports AJAX, which I don't believe any other mobile device can do, including the iPhone. The N810 also adds support for Windows Media codecs, which gives you access to more video content on the web. Besides Skype and Mozilla, other applications supported include Rhapsody, Gizmo as well as a few games (Chess, Blocks, Mahjong and Marbles). Gizmo, a Skype competitor apparently even supports video chat on the device. Cool! \nRetailers where you can buy the Nokia N810 Internet Tablet include Best Buy Mobile, CompUSA, Micro Center, and Nokia stores in New York and Chicago. The N810 is available for a suggested retail price of \$479.